Tracy made these darling bibs with Hush Baby designs and added the most adorable saying. Tracy has a great ebay shop so be sure to have a look. Celine also sent in this fantastic baby projects she made using Hush Baby designs. Celine has a website so be sure to have a look! Celine also has been making postcards and with embroidery designs and sent in this one she made using Hush Baby designs - a great idea. Celine has a website so be sure to visit! Barbara sent in this sweet nappy she made using Hush Baby designs. Beth made this adorable quilt for her daughter who is expecting shortly using Hush Baby designs. Leilany also made this darling burp cloth using a design from Hush Baby. Beth made this great tote using a Hush Baby design. The tote project came from a great site for projects called Craftster. Mirta made this burp cloth using Hush Baby designs. So sweet! Mirta also sent this picture of some darling Hush Baby receiving blankets she made. PeggyLou sent in this darling little blanket she made wiht a Hush Baby design. Mirta sent in this cute burp cloth that she made with a Hush Baby's design. Samantha sent in these pictures of products she has made for her business, Starkelicious Trendz, using designs from Hush Baby. 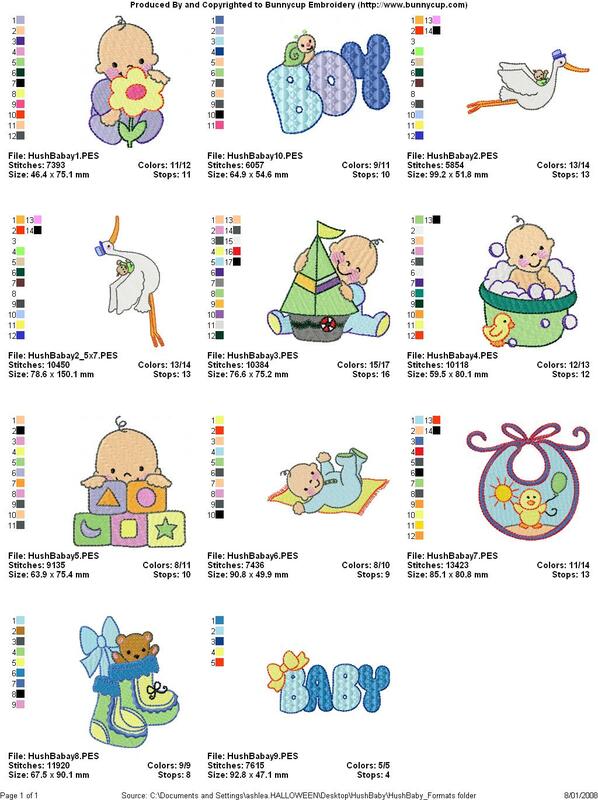 PeggyLou sent in this picture of a wonderful growth chart she made using a variety of designs from Kids Minis, Circle of Friends, Hush Baby, The Styx, Adorable Sentiments and Boys Minis.